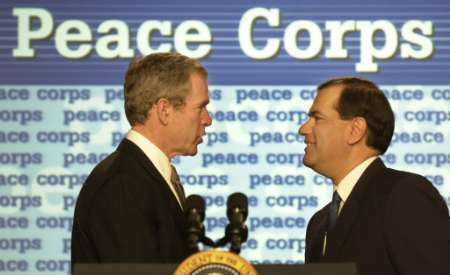 " I want to thank Gaddi Vasquez, who's the Director of the Peace Corps, who is here. We just came from a roundtable discussion, and somebody came up with the idea, as this initiative goes forward and we get a good piece of legislation out of Congress, and when I sign it, hopefully before Memorial Day, one of the things we may want to do is to convert some of our Peace Corps to helping people in Africa who have got AIDS. So Gaddi, I want you to think carefully about that idea." 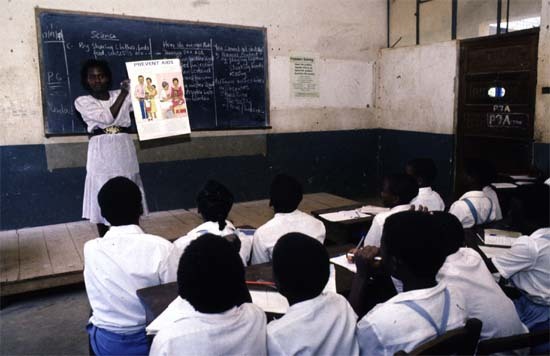 Teachers in primary schools are to be trained in HIV/Aids education in a two-year project sponsored by US Peace Corps. The project's volunteers will focus more on rural areas, US Charge d'Affaires, Mr William Brencick said. He said that was part of the assistance his government has been offering to the ministries of Education and Labour in the fight against the scourge. "True development is about helping people to help themselves, it is not about how much money one can bring to the people," he said. Mr Brencick, who was accompanied by senior government officials, presided over the swearing-in ceremony of 23 volunteers who will be assigned duties in different parts of the country. He said the peace corps comprised people of different careers and walks of life who would make a difference in various communities. A difference could be made in turning the tide so Kenyans could have skills to contribute to economic growth, he said. "I pose a challenge to you to join hands in helping Kenyan communities to fight the greatest development challenge, that is, HIV/Aids. The government has already declared it a national disaster which is robbing Kenya of its most precious resource," he told the volunteers. Mr Brencick urged the volunteers to help Kenyans to start and better manage businesses by improving the quality of their products, strengthening the marketing links. Labour Permanent Secretary Joshua Terer said the volunteer scheme had contributed immensely to poverty alleviation by establishing revolving funds to help improve credit access in rural communities. He said it had increased people's incomes by employing them and creating markets, including the African Growth and Opportunity Act (AGOA).